Our product range includes a wide range of paper dyes for paper industry. Owing to a long-term destination for our business, we are engaged in offering a wide gamut of Paper Dyes for Paper Industry. The offered dyes are processed using supreme quality chemical compounds and advanced technology in sync with industry norms. Our provided dyes are packed with high precision so as to fulfill the demands of our clients. Moreover, these dyes are highly appreciated in the market owing to their different quality attributes. 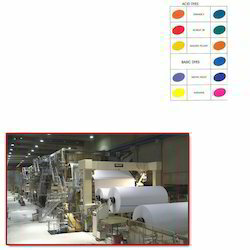 Looking for Paper Dyes for Paper Industry ?